Hi, I'm Rayne Hall. I help good writers become great. Rayne Hall is the an author and publishing strategist. She has more than sixty books published in several genres (mostly non-fiction, horror and fantasy) under several pen names (mostly Rayne Hall), by several publishers (including self-published), in several languages (mostly English). Her blue Writer’s Craft guides are bestsellers. They help writers who have progressed beyond the basics and are ready to take their writing to the next level of skill and success. Rayne answers writing-related questions on Twitter, posts articles online, coaches authors, edits books, manages publishing projects, consults publishers, speaks at conferences and teaches online classes. Rayne has been working in the publishing industry for three decades, as a trainee publishing manager, editorial assistant, magazine editor, investigative journalist, production editor, literary agent and publishing consultant. In between, and often at the same time, she has been a museum guide, adult education teacher, development aid worker, apple picker, tarot reader, trade fair hostess, translator, belly dancer and tarot reader. After living in Germany, China, Mongolia and Nepal, she has on the south coast of England, where she enjoys gardening and walking along the seashore. She writes her books on a laptop, with a lucky black cat snuggling between her arms. Sulu is a rescue from the local cat shelter, and he enjoys his new life as a writer’s muse and takes great interest in Rayne's writing work. 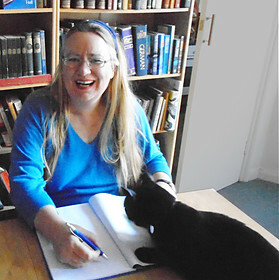 Writing, book publishing, indie publishing (self-publishing), editing, marketing strategy, Twitter, reading books, fantasy fiction, horror fiction, flower gardening, organinc gardening, castles, Sussex, history, archaeology, cats, cat training.